← Hot and Cold Starts for Hitters. Do they mean anything? 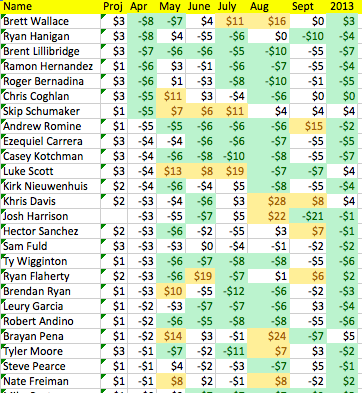 We’re looking at the April 2013 earnings of hitters. 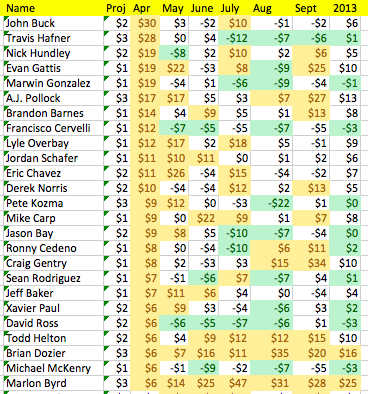 When we slice and dice the cheap guys, those who sank in the auction because no one felt the need to bid them up, we come up with 25 such hitters who earned more than $5 in April. These are guys who went for $3 to $1 in startup leagues. Given the hype on Evan Gattis in Spring Training it’s surprising he went for only a buck, and you should have believed the hype. He earned $19 in April, $22 in May and $25 in September. Of course, in the other months he didn’t do nearly as much, and earned $10 on the season overall. But that made him a bargain, but not a difference maker. This group cost a total of $43 and earned $295 in April. While they never came close to that in any other month ($135, $74, $115, $23, $177 in subsequent months), 15 of 25 made a profit on the year, and six of those earned $10 or more. All in all, a cheapie off to a good start should be believed. Not so those who get off to a bad start. Lots of green on this chart, and only four of these guys earned a profit at the end of the year. -$37, -$64, $6, and -$35. While there were a few good months out there for these guys, for the most part it was better to let them go as soon as they went wrong in April.